System designers integrating radio frequency IoT technologies into their products have a large, fragmented and, sometimes, confusing set of communications stacks and standards from which to choose. In a previous article, I compared several IoT communications standards, quickly leaving some of them behind and concentrating on the differences between BlueTooth Low Energy (BLE) and IoTMesh (IEEE 802.15.4e with IETF 6LoWPAN, RPL, and COaP), as, in my perspective, these latter standards had more merit to serve as the underpinnings for various IoT local area network (IoT LAN) applications than other and older standards (e.g. Zigbee, Z-Wave). Well, IoT radio technology is moving at Internet speed, and recently, new IoT wide area networking standards have gained great mindshare and marketing traction in the fomenting IoT fray. Two such newcomers are LoRa® and SigFox. LoRa® was invented by Semtech Corporation and is promoted and curated by the LoRa AllianceTM. LoRa® is attracting quite a buzz, and is really an interesting and a potentially very powerful technology upon which IoT-based products and services might be built. LoRa® and LoRaWANTM, from the LoRa AllianceTM , are the subjects of this article. 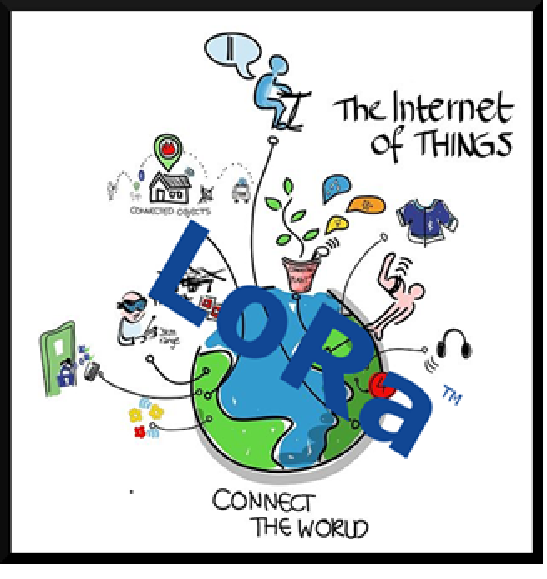 Here I hope to give you a brief introduction to LoRa as a starting point to help systems engineers and applications designers make first-pass suitability decisions regarding their IoT-leveraged products. Well, much is said in a name: LoRa® for long range. LoRa is a sub-Ghz long range, low power, and low data rate, RF and wired wide area network (WAN) communications protocol targeting long-distance distributed IoT applications. Low data-rate IoT communications have long been challenged with being able to communicate over obstructed line-of-sight ranges, particularly while conserving precious remote power sources such as batteries. In many buildings, populated suburban, and, even worse, urban environments, radio waves simply bounce about, cannot penetrate walls, buildings, or thickly forested spans while different transmitters owned by different entities further add chatter noise to already crowded airwaves. This is the challenging environment in which LoRa inserts itself, claiming much better long range communications while, at the same time, conserving precious, remote, power. LoRa is primarily a low data-rate technology (think of temperature sensors, manufacturing process sensors, agricultural monitoring, etc.) and comes at IoT from the cellular network perspective. This cellular perspective gives LoRa a network topology (link structure) that is very much in line with its cellular technology genesis (see the figure above). Looking at the figure, we see that LoRa has a star-of-stars topology and can span great distances, even over a single End Device link (on the order of 15 km), making the technology very IoT friendly. As compared to mesh or node-hopping protocols that were previously required to get such long ranges, LoRa’s End Device extended range capabilities can greatly reduce network complexity and shrink the size of endpoint embedded firmware and processing. But also note, as indicated in the image, that two LoRa End Devices even located right next to each other (as little as a meter or event centimeters apart), still communicate through a LoRa Gateway when desired to talk to each other. Obviously, each End Device represents a fixed hardware cost to your system and indications are that sub-GHz radios of the type used by LoRa are already tending toward commodity level pricing. However, a significant cost for a product or service launched on LoRa can be the recurring costs associated with parts of the hardware and software infrastructure, most probably owned by a third party service provider, that is indicated by enclosure in the cloud graphic above. This third party service provider could be a telecom, or other, company. Think, potentially, “a phone subscription for my IoT devices.” However, IoT device installations may, in fact, provide their own infrastructure or the infrastructure “cell plan” may cost little or nothing. The image, I think, captures a lot of the very high level characteristics of a LoRaWAN network topology. There is, of course, a lot more to it. The fact that LoRa End Devices can be of Class A, B and C, and other characteristics should be understood before choosing LoRa as a platform on which to build your IoT business. However, this article can help get you started thinking in the right direction. What are LoRa’s Range and power consumption capabilities? How fast can it send data? 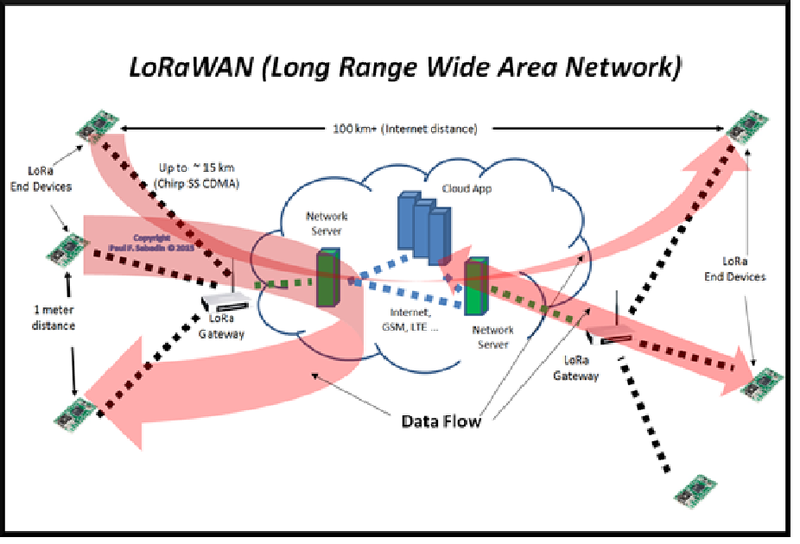 LoRa claims End Device-to-Gateway links to be capable of ranges of up to 10 km at the same time that they deliver data rates of as much as 10 kbs in rural areas (with no line-of-sight obstructions) while the End Device receive currents draw as little as 10 mA. Even longer distances can be had by trading range for lower data rates. This is darned impressive, having myself been hampered in past systems design efforts by meager radio ranges, power consumption problems, and low data rates. LoRa could very well become a key IoT enabling technology! With LoRa, there is choice in the matter of range, particularly when traded against data rate. A discussion of some of the RF modulation and detection techniques used in LoRa is something that any statistical signal processing engineer could sink their teeth into; techniques that yield impressive processing gains on the order of 20 dB over other well known techniques. It is Semtech’s smart investment in such esoteric engineering that, in my view, is responsible for the real value of LoRa; this value is readily measure in valuable radio range. While still obeying the laws of physics, the mathematics required to yield such performance gains quickly become complicated. Still, the primary trade-off of range vs data rate essentially follows from making the temporal length (time) of each transmitted bit longer, allowing the receiver to gather more RF power over longer periods of time and reducing bit-error-rates to acceptable levels for data transmission. Lengthening the time of transmission for each bit, of course, reduces the data rate. But this makes IoT applications that require vastly longer reach (range) while consuming very little power possible, and many business use cases can benefit handsomely by leveraging this LoRa technology. Further, this high gain processing is not limited to be used in the broader LoRaWANTM architecture. Semtech’s and other vendor’s transceiver chips and modules can use this technology to increase radio link range for custom (non-LoRaWANTM and custom protocols) IoT applications. This really is a good and enabling general technology for IoT. It is worth remembering that, although LoRa-based transceiver and communications stack technologies can allow very remote low bandwidth devices to communicate over impressively long distances with very long battery lives there is still no getting around the fact that batteries will eventually need to be replaced. How Mature is it and when Can it be used? Though the LoRa Alliance is populated by some very well known American companies in addition to Semtech (e.g. IBM, Microchip, Cisco Systems), if you want to deploy in the USA today I think you will be on the new and cutting edge. LoRa has been making traction with reference installations primarily in Europe, which appears to be the proving ground for this technology. In many ways, this is a good thing for product developers in the US as, in my opinion, we will be somewhat insulated from the pain and debugging associated with being early adopters of such new technology. At the same time, LoRa is also competing with other low-powered IoT WAN startups such as SigFox who is ahead of LoRa in North America from a time-to-market perspective, and already has some installations in the US. But winning with time-to-market might be trumped by a well executed LoRaWAN North American rollout, deep partner and developer support, and a very high performing IoT solution. In the meantime, I am most impressed by Semtech’s RF link signal processing and RF link range technologies that exists in their transceiver chips today. I would think that, over time, LoRa deployed hardware will improve this technology even further, enabling even longer ranges and more robust RF WAN and LAN IoT networks. For this, I will be keeping my eye on the LoRa Alliance. I think you should, too.